Offering you a complete choice of products which include automatic cold thread rolling machine. With the back of our adroit professionals, we provide our customers a high-quality Automatic Cold Thread Rolling Machine. 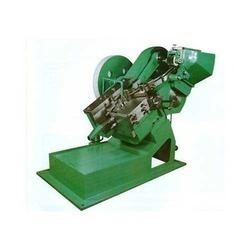 These thread rolling machines are suitable for threading screws bolts, cycle and automatic parts and other similar components from mild steel, brass & aluminum etc. Two flat dies used in these machines are easily fitted & all adjustments are very simple. A water coolant pump keeps the dies cool. We provide this thread rolling machine to our clients at market leading prices.